From Canberra Contemporary Artspace, June 2014. Performer is Louise Curham. work that focuses on the materiality and the consequentiality of performance: the objects that comprise it, the labour that goes into it, the physical sites that give shape to it, as well as the effects it has — what, in short, performance does, and why that is meaningful. Teaching and Learning Cinema has contributed an article to the first edition of the journal which is themed “Archiving Performance”, and edited by Peter Dickinson. 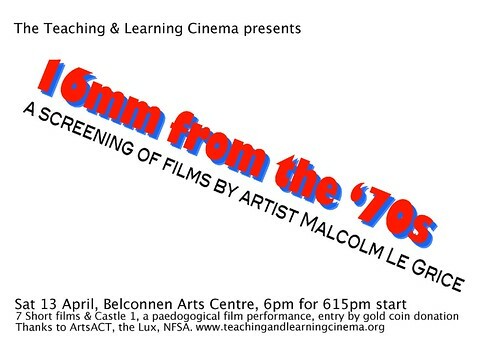 In July 2014 Teaching and Learning Cinema, an Australian artist group coordinated by Louise Curham and Lucas Ihlein, presented a reenactment of Malcolm Le Grice’s Horror Film 1 (1971) at Canberra Contemporary Art Space. 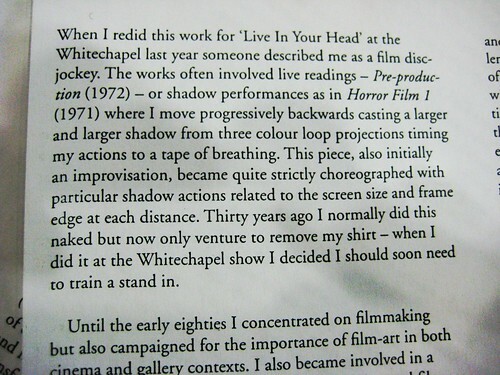 A key work of Expanded Cinema, Horror Film 1 involves a live performer playing with shadows, interacting with the overlapping beams of three 16mm film projectors. Our reenactment was the first time in the work’s 40 year lifespan that it had been performed by anyone other than Le Grice himself. In this paper we offer some reflections on the process of making our reenactment, which we regard as ontologically double: simultaneously “the original object” and an entirely new entity. We discuss our methodology of tending the archive–an activist strategy for operating at the borders of archival and artistic practice. And we suggest that reenactment, as a creative practice, can be a way of “reaching through to the object” which sheds new light on the artwork and its cultural-technological context. You can read the whole article online at Performance Matters Journal. OK – this blog entry is dedicated to exploring the fleshy world of Malcolm Le Grice’s Horror Film 1. If we are to plunge further into the project of re-enacting this work (and it seems that we are!) then we need to have a think about some corporeal issues. By 450pm today we had a rough sketch of the work running in the space. We relied heavily on the audio recordings of our conversations with Malcolm last year for this (audio file 2). 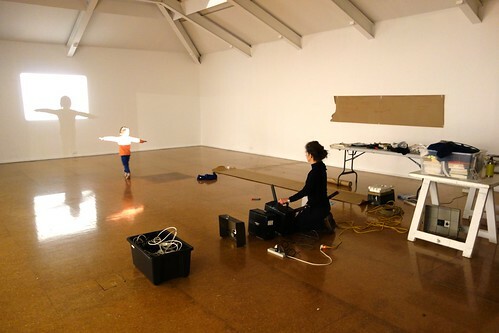 Still lots to do – key is finding zoom lenses for the projectors. We also hope to try a lapel mic for the breath track. 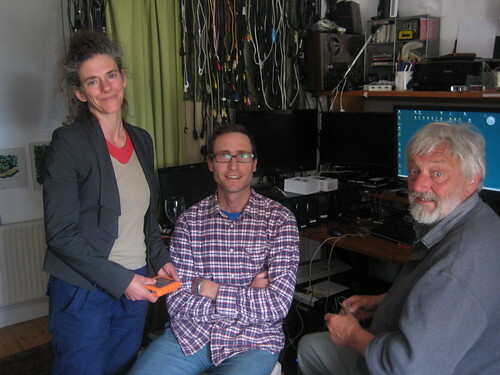 Numerous small hurdles encountered on the way today – not least battery terminal issues on the 1985 Toyota Corolla and of course friends help us out – Danny (Wild) and Jess loaned us not just a projector but also a car. Achievements: 3 x 16mm projectors running in roughly the correct alignment with breath track on mono speaker. This allowed us to both pace through the c. 30 metres from wall to projectors in the main gallery at CCAS. Tasks carried out today: looked at the loops, projectors running the loops, projection frame sizes and height. We had a cursory look at the breath track.